CHICAGO, IL--(Marketwired - April 25, 2017) - MC Squared Energy Services, LLC (mc2) has announced its new "Guaranteed Energy Savings" program. 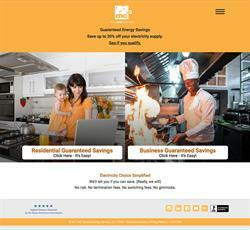 The proprietary offering allows residential and small business customers to enter their 10-digit Commonwealth Edison (ComEd) account number at the mc2 website (mc2energyservices.com) to see if they qualify for a guaranteed energy savings against the utility's published Purchased Electricity Charges tariff rate. The analysis is free of charge, and requires no obligation to purchase. "In less than a minute, our website lets customers know if they qualify for our guaranteed savings offer on their electricity supply charges or whether the utility's current offer may be a better option for that customer," said Chuck Sutton, president of mc2. "In the current marketplace where there are so many different offers and options, we believe simplicity and transparency are things customers will appreciate." If a customer qualifies for the program, they will receive a fixed percentage rate representing the guaranteed savings off the utility's published Purchased Electricity Charges rate for a 12-month term. The 12-month electricity supply charges are equal to the monthly electricity supply charge less the fixed percentage off the total dollar amount of the supply charge. Transmission service charges are billed separately with no mark-up from mc2. Sutton says after a customer signs up with mc2, they will also receive a monthly energy usage report after their first month of service at no additional cost. "This is a handy report that lets customers know how much electricity they are using and offers a comparison against the previous year," explained Sutton. "In addition, they can log on to our website to access their account to review their contract, usage, contact information and monthly utility supply and transmission charges." mc2 is a local Chicago-based company, certified by the Illinois Commerce Commission to provide all customers in ComEd's service territory with retail electric service, serving thousands of customers in Illinois. The Illinois Commerce Commission ranks mc2 with its highest customer service rating of 5-Stars. MC Squared Energy Services, LLC (mc2) is a retail electricity supplier licensed by the Illinois Commerce Commission. mc2 currently provides electricity supply products and services to residential and business accounts in the ComEd service territory in Northern Illinois. mc2 is uniquely positioned to offer customers a full range of reliable electricity supply products. The web portal for MC Squared Energy Services, LLC (www.mc2energyservices.com) where residential and business customers can enter their 10-digit Commonwealth Edison (ComEd) account number to see if they qualify for a guaranteed energy savings against the utility's published Purchased Electricity Charges tariff rate.